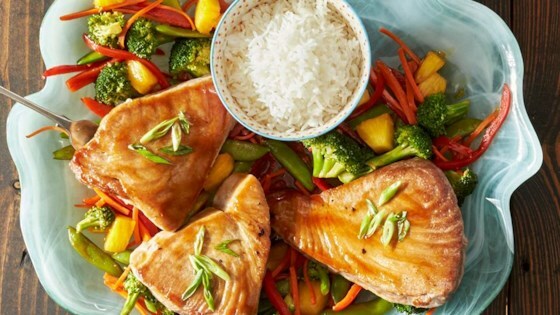 "Bake or grill a meal in a packet with this easy teriyaki tuna steak with pineapple, fresh ginger, and mixed veggies." Center one tuna steak on each sheet of Reynolds Wrap(R) Non-Stick Foil with non-stick (dull) side toward food; top with pineapple chunks. Combine teriyaki sauce, ginger and salt; spoon over tuna and pineapple. Arrange vegetables beside tuna. Bring up foil sides. Double fold top and ends to seal packet, leaving room for heat circulation inside. Repeat to make two packets. Bake 16 to 18 minutes on a cookie sheet in oven. Shrimp and broccoli bake with a ginger and garlic sauce in parchment packets. SERVING SUGGESTION: Sprinkle with salt and pepper and serve with hot cooked rice or couscous, if desired. Maybe it was that I used frozen tuna (fresh is difficult to find in Nebraska), but it was very dry and extremely tough. Didn't care for the marinade on the vegetables, either. Great foil dinner while camping! Used the Swordfish steaks, frozen mixed vegetables, pineapple and teriyaki sauce. Never thought to use fish in a foil dinner but it worked. easy to make and didn't dry out but wasn't flavorful enough for my family even though I doubled the teriyaki/ginger sauce. Very tasty. Be careful not to overdo the tuna.